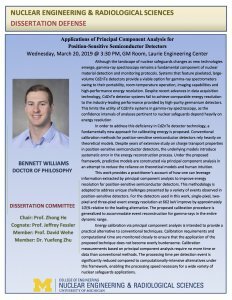 Abstract: Although the landscape of nuclear safeguards changes as new technologies emerge, gamma-ray spectroscopy remains a fundamental component of nuclear material detection and monitoring protocols. Systems that feature pixelated, large- volume CdZnTe detectors provide a viable option for gamma-ray spectrometers owing to their portability, room-temperature operation, imaging capabilities and high-performance energy resolution. Despite recent advances in data acquisition technology, CdZnTe detector systems fail to achieve comparable energy resolution to the industry-leading performance provided by high-purity germanium detectors. This limits the utility of CdZnTe systems in gamma-ray spectroscopy, as the confidence intervals of analyses pertinent to nuclear safeguards depend heavily on energy resolution. In order to address this deficiency in CdZnTe detector technology, a fundamentally new approach for calibrating energy is proposed. Conventional calibration methods for position-sensitive semiconductor detectors rely heavily on theoretical models. Despite years of extensive study on charge transport properties in position-sensitive semiconductor detectors, the underlying models introduce systematic error in the energy reconstruction process. Under the proposed framework, predictive models are constructed via principal component analysis in an attempt to reduce the reliance on theoretical models and human intuition. This work provides a practitioner's account of how one can leverage information extracted by principal component analysis to improve energy resolution for position-sensitive semiconductor detectors. This methodology is adapted to address unique challenges presented by a variety of events observed in position-sensitive detectors. For the detectors used in this work, single-pixel, two- pixel and three-pixel event energy resolution at 662 keV improve by approximately 10\% relative to the leading alternative. The proposed calibration procedure is generalized to accommodate event reconstruction for gamma-rays in the entire dynamic range. Energy calibration via principal component analysis is intended to provide a practical alternative to conventional techniques. Calibration requirements and computational time are monitored closely to ensure that the application of the proposed technique does not become overly burdensome. Calibration measurements based on principal component analysis require no more time or data than conventional methods. The processing time per detection event is significantly reduced compared to computationally-intensive alternatives under this framework, enabling the processing speed necessary for a wide variety of nuclear safeguards applications.